Sympathy for Fenians – Irish nationalists – was strong on the West Coast. In 1868 three Fenians were charged with killing a British policeman while trying to liberate two of their comrades from a Manchester police van. The evidence against them was circumstantial, but they were convicted and hanged. 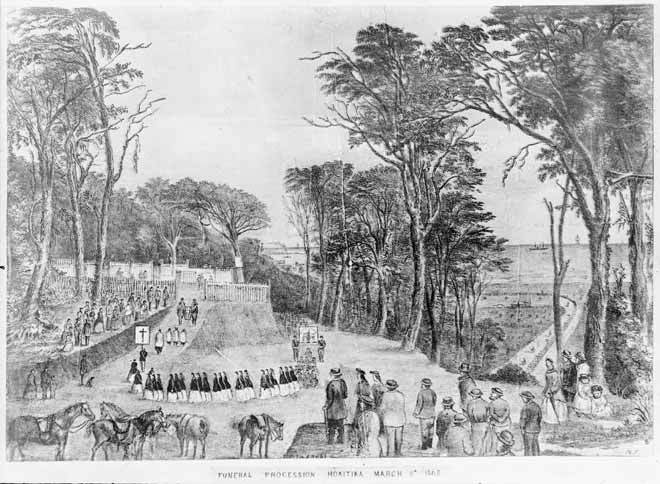 Anger over their execution led to this mock funeral and demonstration at Hokitika. It was led by a Catholic priest and ended at the cemetery, where a cross was erected to their memory. The procession of almost 800 people is depicted in this 1868 artwork.